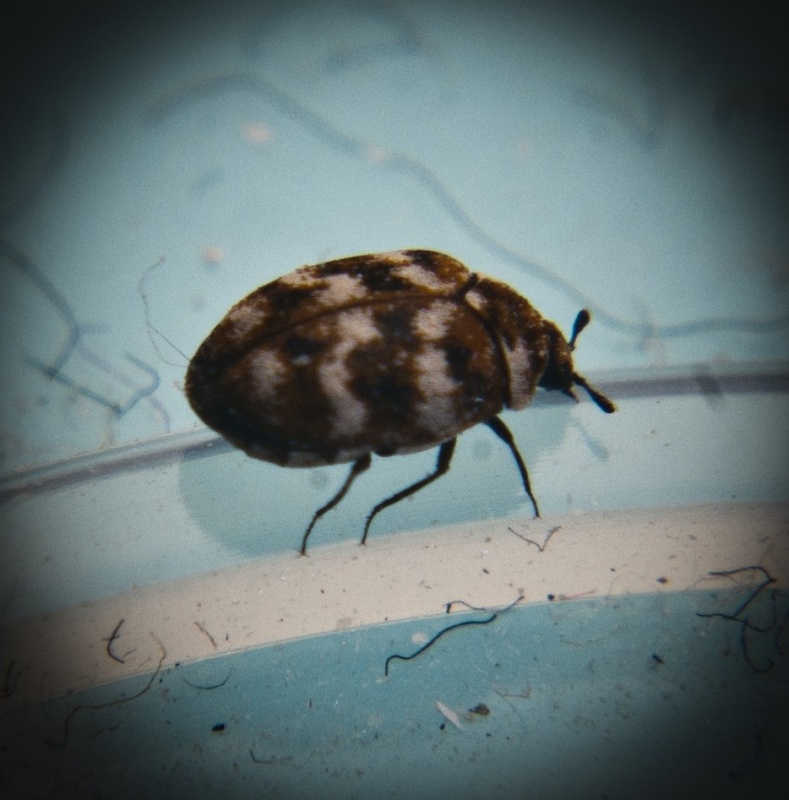 The notorious Varied Carpet Beetle, also known as the Variegated Carpet Beetle or Museum Beetle. It is a very small beetle (1 to 3 mm long only) with a highly variable pattern of yellowish and whitish markings. It can be found all year round, both inside the house and outside. Has been transported by humans with leather, wool and textile and is nowadays to be found all over the world. The larvae live of all kinds of dead natural stuff, such as wool, feathers etc. In nature it lives in old nests of birds, wasps etc. I used the full close up filter set +10, +4, +2, +1 with two flash guns F16 at 1/60 second chasing it around the rim of a CD spool focus set to 250mm and camera moved until in focus. Then heavy crop and some Post Crop Vignetting in Camera Raw 6.5. I then caught it in a SD card box to use latter. Would like to get it under microscope but only way I can think of doing it is to kill it first. So open to all ideas on how to improve on the shot. I would say this one was about 1mm long which is of course the problem. Eric, if the creature is only 1mm long then I'm well impressed and don't feel I have a right to comment! Well done. Whilst it isn't that sort of thing I would hang up on a wall, I'm impressed. I wish there was a ruler in the shot to help give a sense of scale, or maybe a coin to do the same. How mobile are they, could you place a penny nearby just to get the scale?